In 1926, the U.S. Mint released the Sesquicentennial of American Independence commemorative quarter eagle. Celebrating the 150th anniversary of the signing of the Declaration of Independence, a half dollar and a quarter eagle were both authorized by the Act of March 3, 1925. A maximum of one million half dollars were to be struck and 200,000 quarter eagles. This was only the second commemorative of that denomination after the 1915 Panama-Pacific commemorative. While the original bill that called for this issue included plans to include a $1.50 coin (a unique denomination, as the United States has never struck such a coin to this day), this was not approved by the secretary of the Treasury, Andrew Mellon. Unlike the previous issue, which included both gold and silver coins (the Grant Memorial commemoratives issued four years earlier, in 1922), the designs for the two different denominations were different from each other, although the same person, John Ray Sinnock, designed them both. While Sinnock based his design of the half dollar on sketches provided by local artist John Frederick Lewis, it is believed that Sinnock based the design of the quarter eagle on his own sketches (although sources sometimes switch the two denominations). John R. Sinnock was the eighth chief engraver of the United States, serving in that position from 1925 to 1947. He was born in Raton, New Mexico, on July 8, 1888. Acquiring an interest in art at a young age, he enrolled at the Philadelphia Museum School of Industrial Art and earned a degree in normal art instruction. Sinnock would soon start working as an assistant sculptor for the United States Mint, and his first coin design would be the reverse of the 1918 Lincoln Illinois Centennial half dollar (Morgan designed the obverse). In 1923, he was hired as assistant chief engraver by Morgan and took over his position as chief engraver when Morgan passed away in 1925. Other designs by him would be the Roosevelt dime and the obverse of the Franklin half dollar (based on an earlier medal by him), as well as the Purple Heart and numerous medals. He passed away at the age of 59 on May 14, 1947, never seeing his final work, which was first released for circulation during the following year. 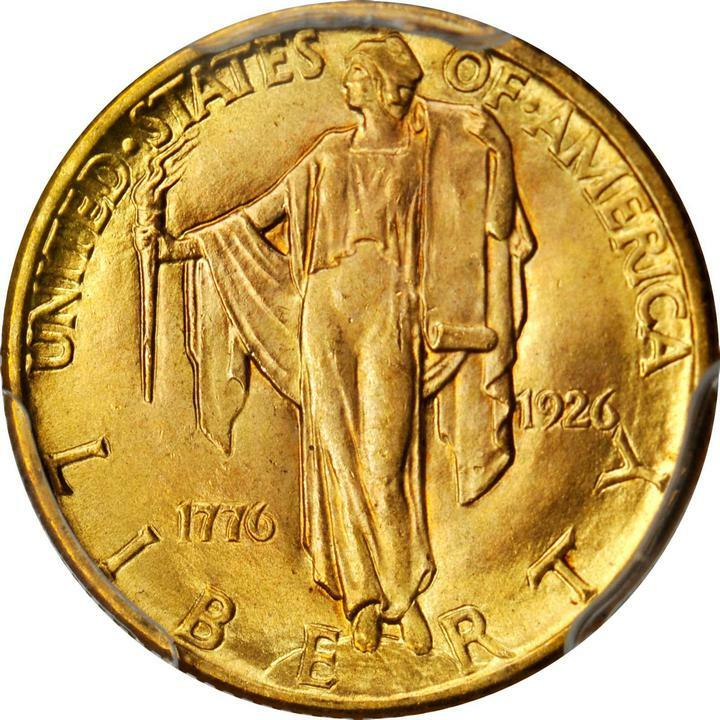 Sinnock’s design for the 1926 Sesquicentennial quarter eagle featured Liberty standing on a globe, holding out a torch (of Freedom) in her right hand and a scroll (representing the Declaration of Independence) in her left. In the lower left field is the date 1776, while in the right field is the date 1926. The word LIBERTY is below, and along the top is UNITED·STATES / OF·AMERICA, the words separated by the head of Liberty. 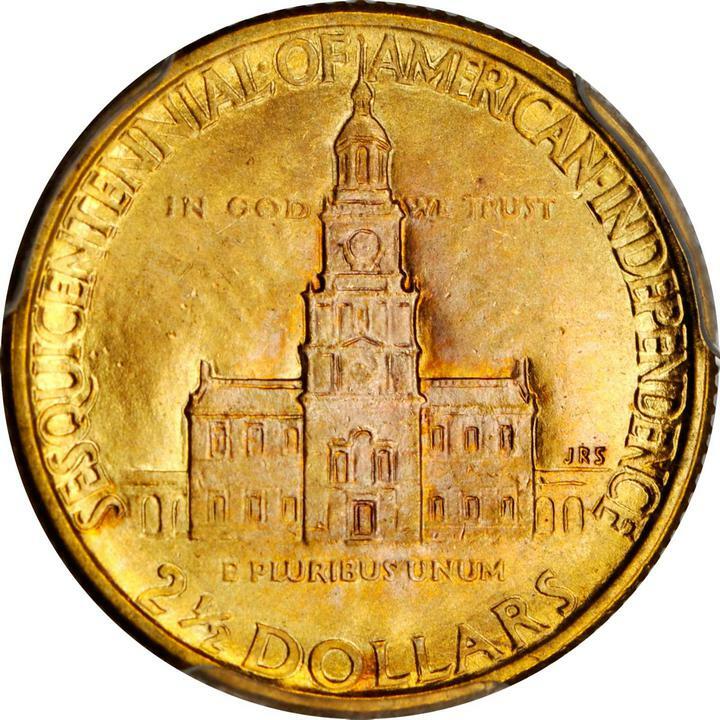 The coins were to be distributed at the Sesquicentennial Exposition (the official name was “Sesqui-Centennial International Exposition”), which was appropriately held in Philadelphia from May 31, 1926, to November 30 of the same year. The exposition was located in South Philadelphia and included a replica of the Liberty Bell (including 26,000 light bulbs to illuminate it), one of the largest pipe organs in the world, and the Sesqui-Centennial Stadium (which would later be known as the John F. Kennedy Stadium). It would be one of the few lasting parts of the exposition, as it would stand until 1992 when it was finally demolished. The only true survivor is the Benjamin Franklin Bridge, a suspension bridge that was the first bridge to cross the Delaware River between Philadelphia and New Jersey, and an important route into Philadelphia to this day. The exhibition also featured educational exhibits, as well as a small amusement park. Anticipating high demand for the issue, the Philadelphia Mint struck the total number of authorized pieces (200,000 coins) in May and June of 1926. The coins were offered for sale at a cost of $4 each, which at the time was a very reasonable amount and was the same price the 1915 Panama-Pacific quarter eagles had been a decade earlier. Yet, sales were not as good as expected, probably because $4 was still a steep price for most people at the time. When sales came to a standstill, a total of 154,207 coins (or more than 75% of the original mintage) were returned to the Philadelphia Mint and melted. This left a net mintage of 45,793 — still by far the highest net mintage for any of the gold commemorative issues between 1903 and 1926. Because of the high mintage, this is also considered to be the most common of the classic commemoratives, with most surviving pieces grading in the lower ranges of Mint State. 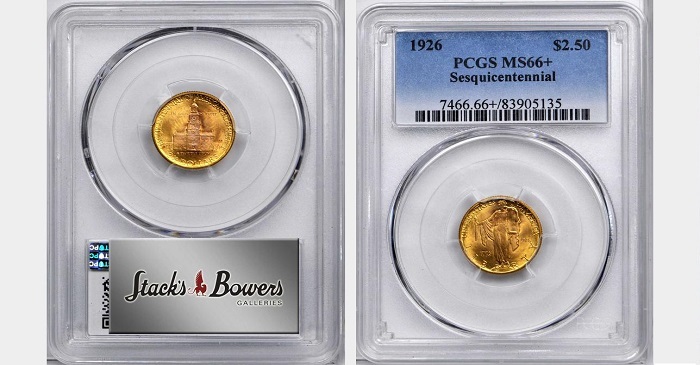 Unfortunately, many of the coins were not cared for properly, and while pieces up to the MS-63 level are easily found, this issue becomes surprisingly difficult to find in MS-65 and finer grades. With many collectors trying to assemble the 11-piece gold commemorative set (skipping the two $50 gold pieces due to their high cost) in gem condition, coins in that grade are very popular, and tend to sell very quickly. This would be the last commemorative gold coin struck until 1984, when the Mint struck its first gold commemorative coin in almost 60 years, and the first gold coin in over half a century.